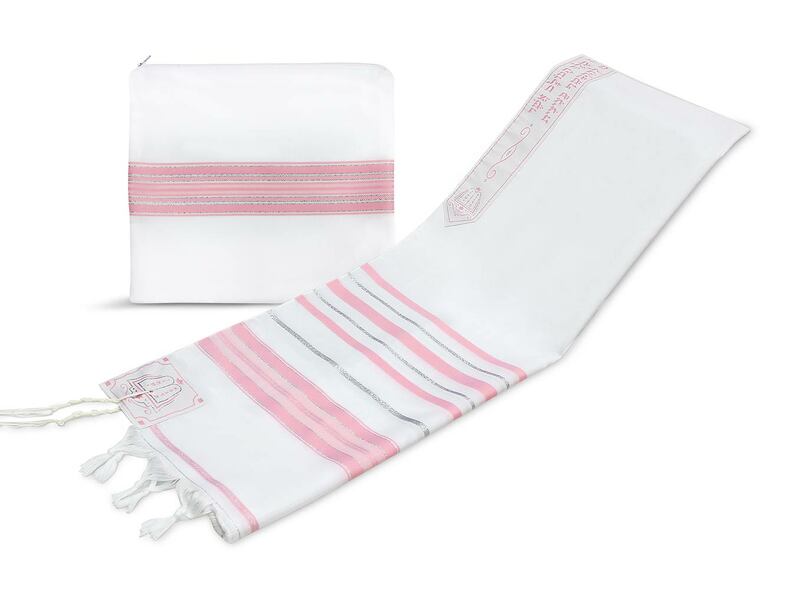 This classic Women's Tallit set is both, beautiful and affordable. Woven with traditional stripes in a medium pink color adjoined with metallic silver stripes. The Talis Neckband bears the full Hebrew blessing that is recited on a Tallis with the vowels. The corners are also embroidered with the tablets and 10 commandments. Set includes the Tallit and a fully lined and zippered matching bag. Imported from Israel. Available in 13" x 64 (for girls/women upto 5' tall) or 18" x 72" (standard adult size). Bag measures 11.5 L" x 11 H". You will have the options to personalize this set as you proceed to checkout.